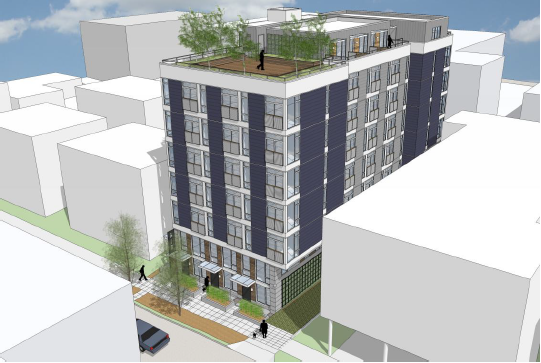 The city’s design process for two new seven-story apartment projects on Capitol Hill moves forward this week as the 550 Broadway development and a “workforce” apartment complex at 418 Bellevue E go through recommendation sessions with the Capitol Hill Design Review Board. 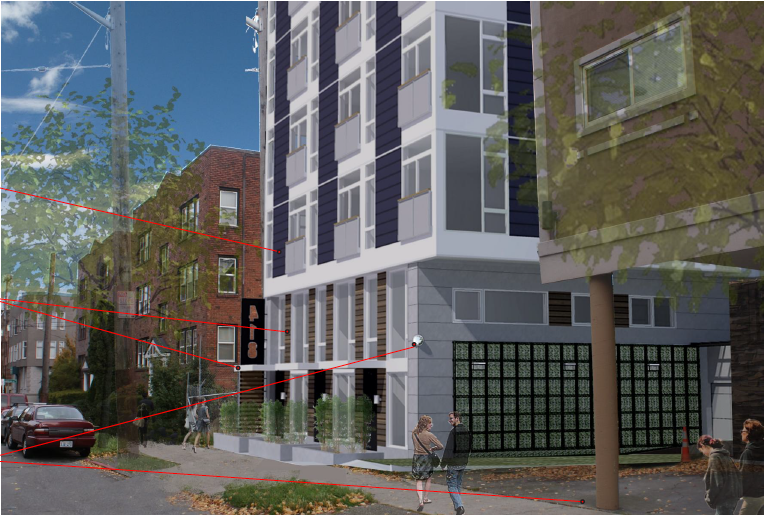 For both projects, Wednesday night could be the final session of review and public comment before the board makes its recommendations for the final building designs as Capitol Hill continues to build toward the sky. The 550 Broadway project certainly won’t overshadow its neighbors Seattle University’s Campion Hall and Swedish First Hill hospital. The project will replace the old building at Broadway and James that has been home to restaurants and a handful of apartment units with a seven-story mixed-use building. The structure will be built in the shadow of Campion Hall on the western edge of SU’s campus. Plans call for 5,500 square feet of retail, two live/work units, 189 apartments and parking for 108 vehicles within the structure. Developer is Stratford Properties with design by Ankrom Moisan Associated Architects. The updated design packet for the recommendation meeting is below. You can review notes from one of the two previous design sessions here. CHS comments from the summer sessions were mostly focused on the wisdom of zoning that allows developers to build to seven stories. Still up in the air for the board this week as items like materials and landscaping are discussed is the building’s massing and whether a large central courtyard should face Broadway or the SU housing building as the developer’s prefer. Perhaps less of a “natural” seven-story fit is the 418 Bellevue Ave E development, a project slogging its way through the twists and turns of process and economy since January 2006. 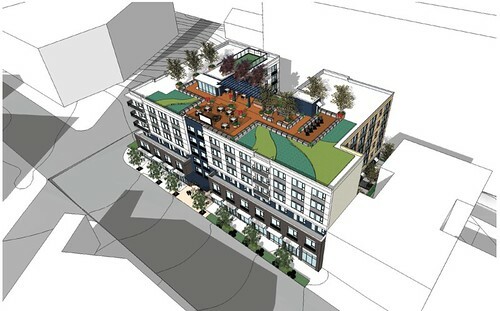 Developer Langer Properties plans to build a 75-foot “workforce” affordable housing building at 418 Bellevue Ave E with 45 units (reduced from 67) and underground parking for 16 vehicles. Design is by Runberg Architecture Group. you’ve got to be kidding in asserting that desnity virtue trumps all. You see, PEOPLE have to LIVE in and on either side of this blocky lug of a proposed building. Take it from uber-succesful urban development in Vancouver, BC: you have to leave space for light, air and greenery around each new structure to keep people sane, especially in our light-limited Pac NW. Anything else is plain moronic. This project should absolutely not be approved with these absurdly inadequate setbacks. 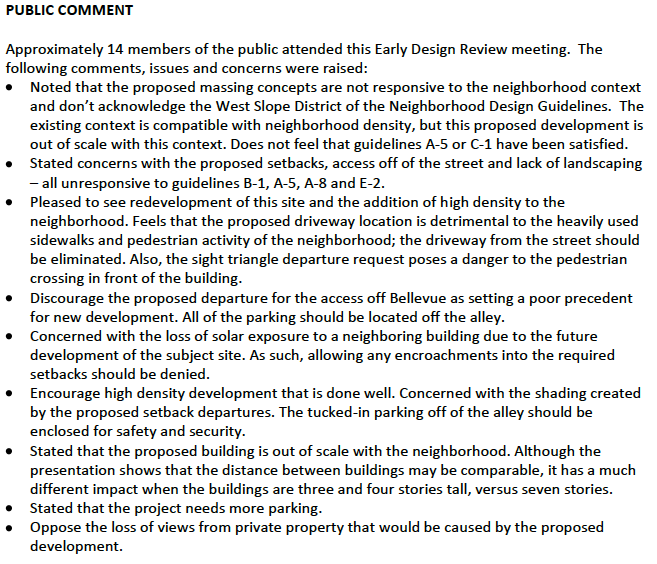 The design board won’t be knocking off any stories come Wednesday nights meeting but we’ll see what kind of standards they hold the final design elements to given the concerns about the building’s place in the neighborhood and the tradeoffs being made to create affordable housing. 550 Broadway is NOT Capitol Hill. Please learn neighborhood boundries. They are well signed throughout our city. Just saying. Sure. You can also call it the Central District (as some do) or First Hill (as others do). But I would never go by the signs. Perhaps the neighbors would prefer to have a vacant lot there forever? Sheesh. Please don’t read this blog, it is about Capitol Hill. I used to live in the building next door to the empty lot, with lovely southern exposure on the side facing the lot. It was great! I’m sure the people currently in that building would prefer to live next to an empty lot, and it’s likely that some will move out during construction. I’m quite happy that I moved out before construction began. If we allowed more vacant lots in the city center we’d encourage more sprawl or have to have many more “taller” buildings throughout neighborhoods – think many 8-10 stories and a few 15 stories on Capitol Hill and Central District. A much smaller building, or better yet a townhouse, would be much more appropriate for the site. Uh, I don’t think the developer is ignoring the city plan. They’re building whatever is allowed by zoning. That’s the city plan. Why is it greedy to build what is allowed by the zoning code? The goal of a zoning code that allows for tall buildings is to encourage tall buildings in urban areas where there’s good transit service and other infrasture that supports it. It’s called good city planning, aka Smart Growth. I doubt the 7-story building will really be a problem for the building next to it. All of the units in the smaller building have windows on three sides. The east and west sides of the building are not blocked by anything (and won’t be because there’s a street to the west and a lawn to the east), so even with the light from the southern side reduced, the units will get more light than many apartments/condos get. The only unit that will really suffer is the basement studio. Of course zoning allows it, but that doesn’t mean it’s the right fit for the lot, or for the neighborhood. It’s “shoe-horned” in to maximize profit. Money makes the world go ’round. This is a good development. The more people we can get to live in dense neighborhoods, the less lifeless suburbun housing plantations we’ll have to build in old growth forests. I’m not sure what is ‘good’ about the design. 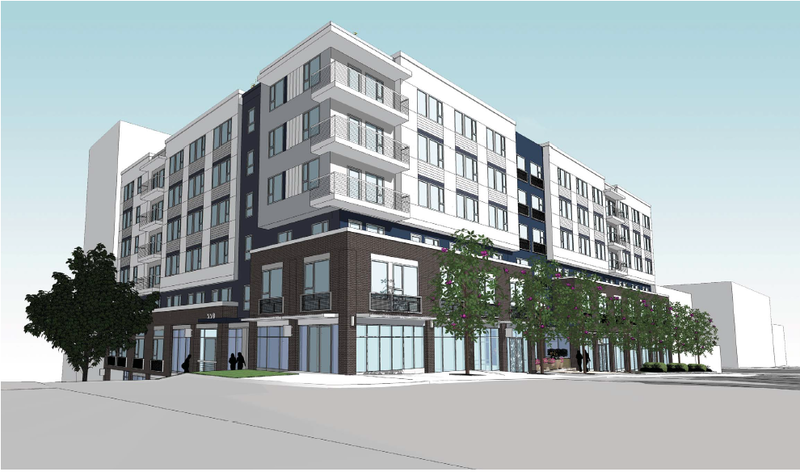 As stated in the review, it is out of scale for the neighborhood, and needs more parking – 16 parking spaces for a 45 unit building? That is absurd. Of course density is good…no one these days believes otherwise. But that doesn’t mean every proposed building is a good fit for the neighborhood. I’ll bet you would oppose this building if you lived in one of the buildings next door. You have to not just look at a neighborhood’s past and present but a neighborhood’s future. This building is a good fit for the present and future. It isn’t a 10-15-20 story building. Those building sizes would be on the extreme side and are many decades away for that part of the hill. This 7-story building is perfect size for today and tomorrow. Uh, the new building is 7 stories… isn’t the Erawan across the street 6 stories? It hardly seems out of scale with the rest of the neighborhood. It’s not the height that is the problem, it’s the bulk, and the fact that it will be built very close to the property lines, if the developer gets his way. There’s something to be said for reasonable setbacks and some nice landscaping…these things add to the harmony of the streetscape.